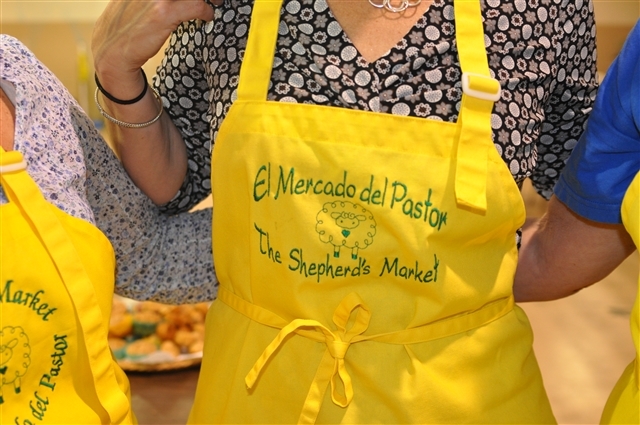 Volunteers at The Shepherd’s Market wear identifying aprons as they work in the client-choice food pantry sponsored by and housed at St. John’s UMC in Baton Rouge. Nashville, Tenn.: Local United Methodist churches will Rethink Church and fight hunger this fall with a new effort aimed at feeding individuals and equipping communities near and far. Congregations are encouraged to dedicate a Sunday to hunger awareness with free bulletin covers and worship slides that are available for download. Churches with existing hunger ministries may download 15- and 30-second videos for use in worship services or social media. Customized ads are also available by emailing mediaservices@umcom.org. National advertising will occur on the Food Network through Nov. 9. United Methodist Communications has also provided ten tips for congregations wanting to create a hunger ministry. For more information about how The United Methodist Church is fighting hunger to change lives and transform the world, go to http://rethinkchurch.org/articles/hunger.